Successfully Added Micro Mini Helicopter with IR Remote Control to your Shopping Cart. Micro Mini Helicopter with IR Remote Control. Take to the skies with this micro mini helicopter. Take to the skies with this micro mini helicopter. This pint-sized helicopter with flashing lights will have your friends staring in awe as you buzz past their heads. Simple, easy-to-use controls make it great for that novice pilot on your gift list. The micro 'copter's even weight distribution and spin controller help it fly a steady path as well as hover in place. With big, simple controls, flying this Micro Helicopter will come naturally to you whether you're a beginner or an ace. With three channels of control, you can fly one helicopter while your wingmate flies another. The controller lets you change altitude, move left and right, and hover in place. Chinavasion's unbeatable factory-direct prices let you get your wings on a budget. 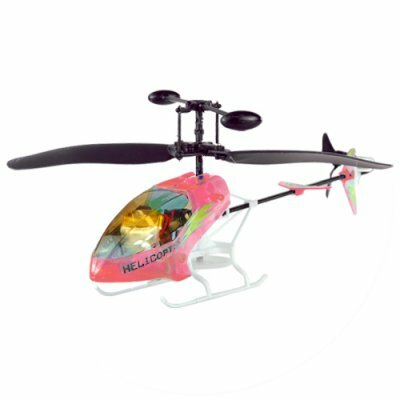 A great helicopter to get started in the RC toy hobby.